Armenia is a little country that,s full of surprises, but perhaps most unexpected is the range of Armenia holidays and festivals which tourists and locals are able to enjoy every year. 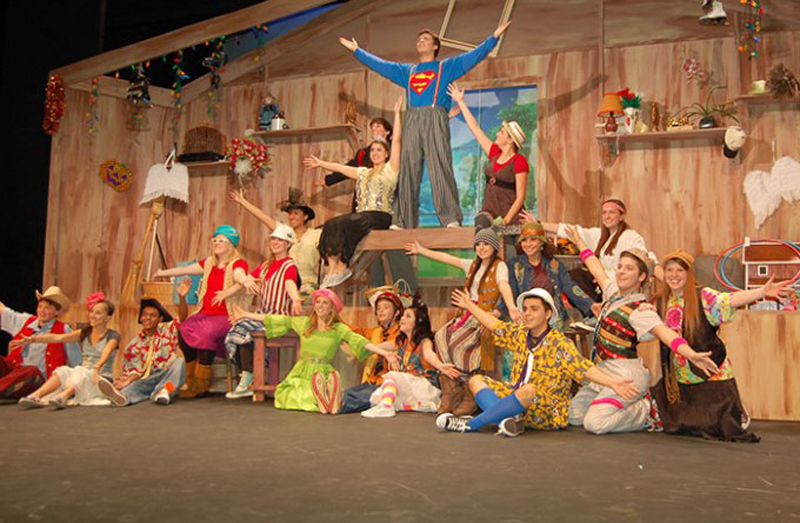 Theatre enthusiasts will revel in the exhibits and displays of the HIGH FEST International Theater event held in October while adrenaline junkies should make their way to Lake Sevan in July for the newly established Extreme Sports Festival. During March, the Armenian diaspora comes together in an artistic display of national unity in the capital city. Taking place every two years, the ,One Nation, One Culture, festival is an attempt to reunite Armenians who were forced to relocate after the Genocide. There are no prescriptions as the festival is based on what each individual and artist brings to the table, making it a little different every year. Visitors to Yerevan during this period have circus acts, fetes, cinema screenings, literature and poetry readings to look forward to. Held annually every July, the Yerevan International Film festival, or the Golden Apricot as it is colloquially known, is a smorgasbord of the best independent films from around the globe. Bringing together directors, producers and cinematographers from Armenia and beyond, the festival aims to live up to its mission statement, a ,Crossroads of Cultures and Civilizations., If you,re a movie buff, the event is well worth experiencing as it showcases some of the most riveting and poignant contemporary modern cinema. 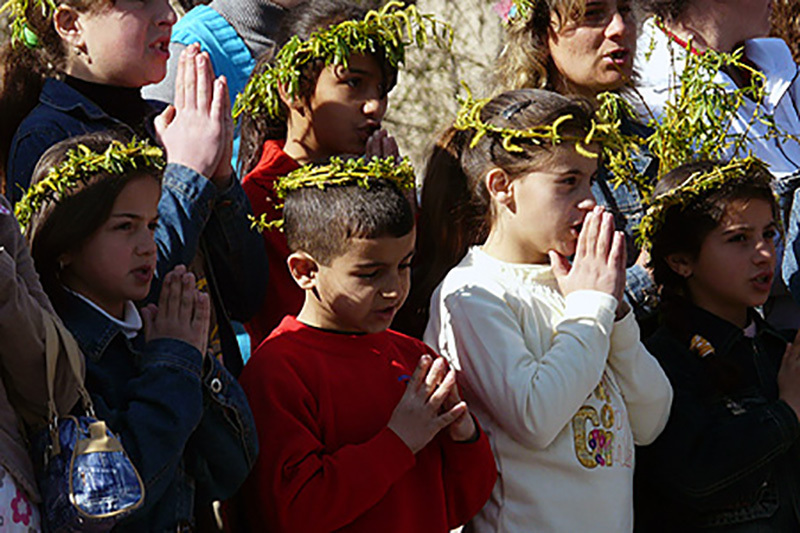 What started as a Pagan festival, Vartavar, or the ,World of Water Day, happens country-wide in July, 14 weeks after the Christian Easter holiday. This festival is particularly popular with children who thoroughly enjoy the main activity , pouring buckets of water on people as a blessing and a sign of cleansing. While most visitors may not understand the significance, tourists generally appreciate the cool water as a much-needed respite from the scorching temperatures of the Armenian summer. A new addition to the Armenian events calendar, the Extreme Sports Festival takes place from August 1 to 10. Several countries compete in death defying feats and technical sporting skills. For 10 days the usually serene Lake Sevan area is transformed into an adrenaline junkie,s paradise to partake in paintball, rock climbing, paragliding and much more. Taking place from October 1 through 8 every year, the main theater festival in the region hosts more than 250 artists from 30 different countries around the world. HIGH FEST aims to create a global culture of collaboration and inspiration and visitors can look forward to multi-genre art such as street performances, mime, dramatic and comedic theater, dance and puppetry. The festival is held in the town of Abovyan (located 10 km north-east of Yerevan) Kotayk region. The festival will feature both traditional and new dishes based on fish. The festival is held at the memorial complex ,Sardarapat, in Armavir region. The festival aims to popularize Armenian dishes, where guests show cabbage varieties and are familiar with the recipes for their preparation. On this day, there is a competition for the title of the original version of the ancient dishes. On weekdays and holidays this dish decorated tables of every Armenian family. Event attendees can try dolma prepared by each of the participants and give their assessment. Also on this day is a holiday ritual food , participants can get acquainted with the national dishes of the Armenian people. Celebrations are accompanied by songs, dances and various competitions. The festival is held at the fortress of Erebuni in Yerevan. 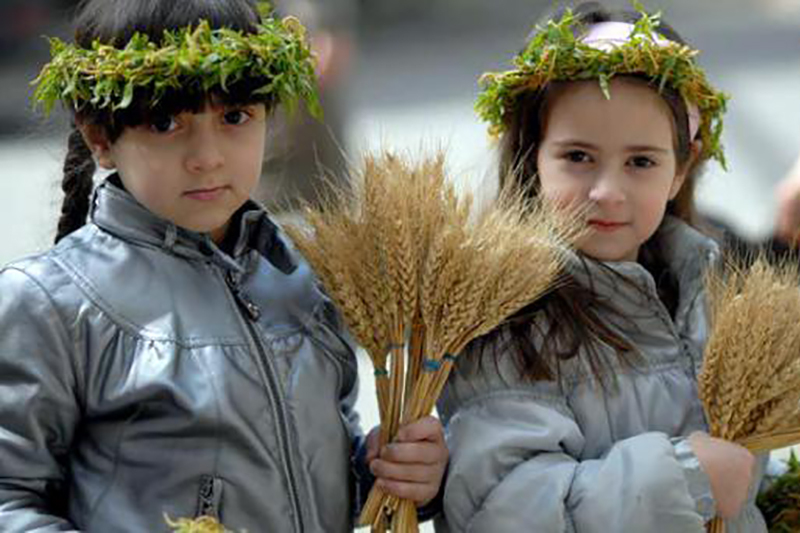 The festival aims to show visitors the history of bread and also its relationship to the rites of the Armenian people. The festival will be held in Goris (located 240 km from Yerevan). Guests can follow the process of making mulberry vodka and, of course, on the spot to taste this drink. 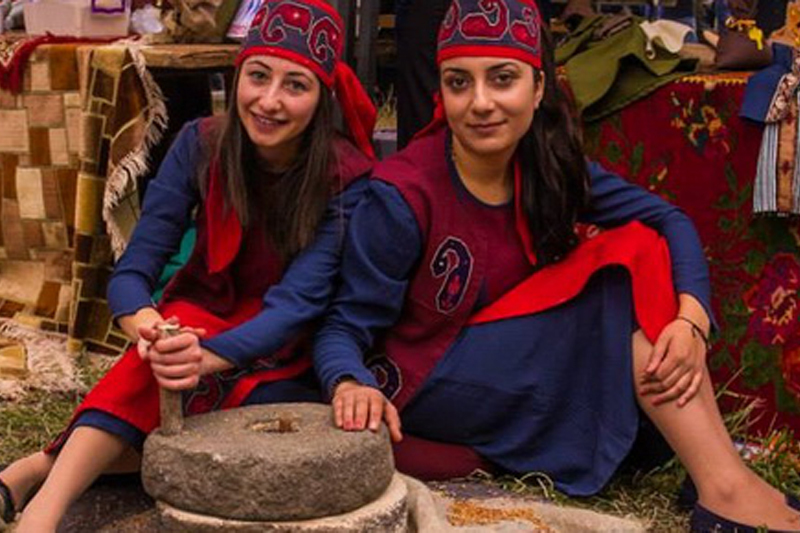 As part of the festival will be held tasting and other food and drinks, traditional Syunik. Will be an exhibition and sale of products of local craftsmen and women-handy people. The festival will not be without folk songs and dances. 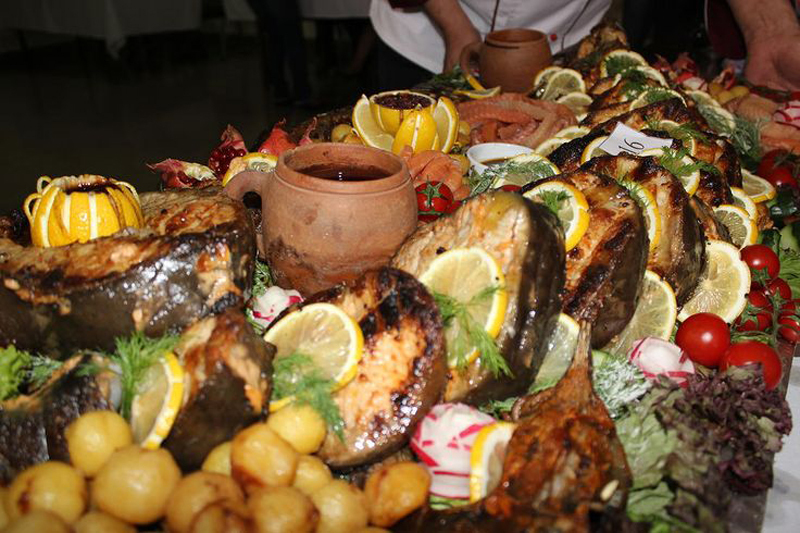 During the festival Armenian national dishes prepared during the celebration of the New Year are presented. A major role in the festival plays Tandoor , a clay oven, which dug into the ground with a clay-covered edges on the bottom which fueled the fire. It was prepared not only for food, it can heat their homes. Tandoor , a symbol of prosperity, as in it dishes and traditional bread , lavash are baked. The festival is held in the town of Dilijan (distance from Yerevan 100 km) in the Tavush region. The festival will feature master from all corners of Armenia and Nagorno-Karabakh. Apart from the traditional exhibition and sale of Armenian carpets, guests will have the opportunity to see the works of applied art of Armenian artists. The festival is held in the town of Akhtala (distance from Yerevan 185 km) in the Lori region. 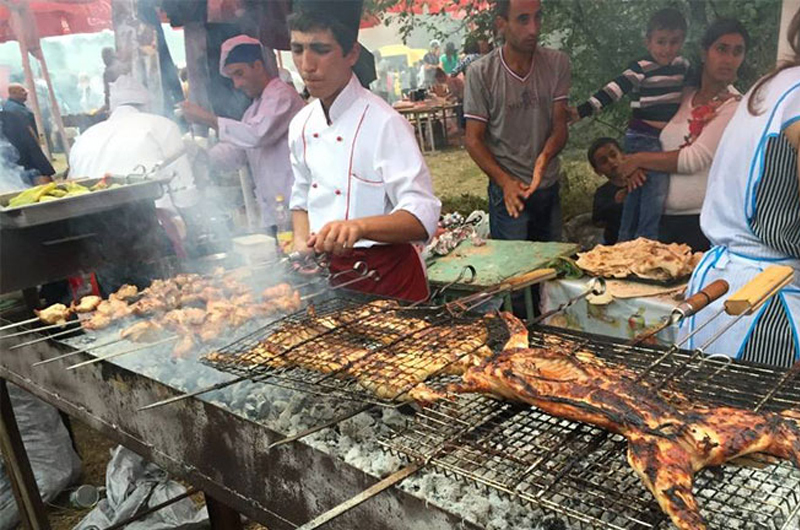 The festival will feature both professional chefs and amateur cooks from different regions of Armenia, representing more than 40 varieties of kebabs. 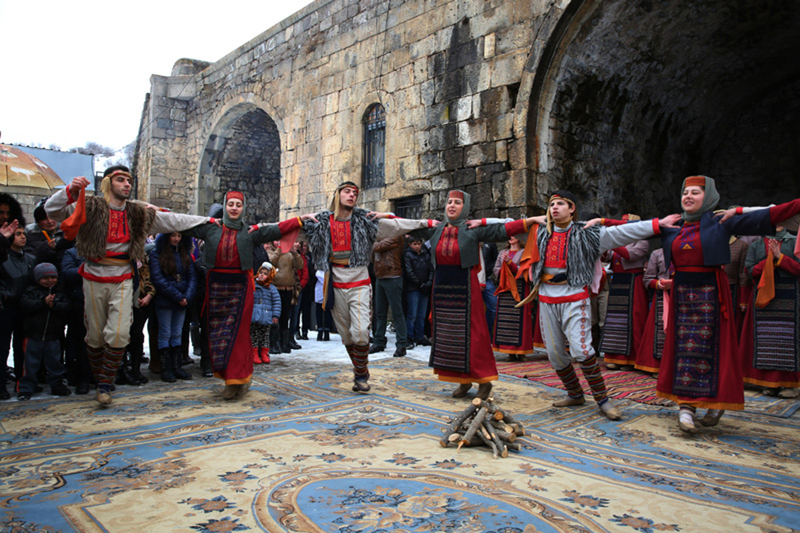 The festival provides a number of other events, including a concert of Armenian national song and dance, traditional games. The festival will have three nominations , best taste, the best design and the best idea. 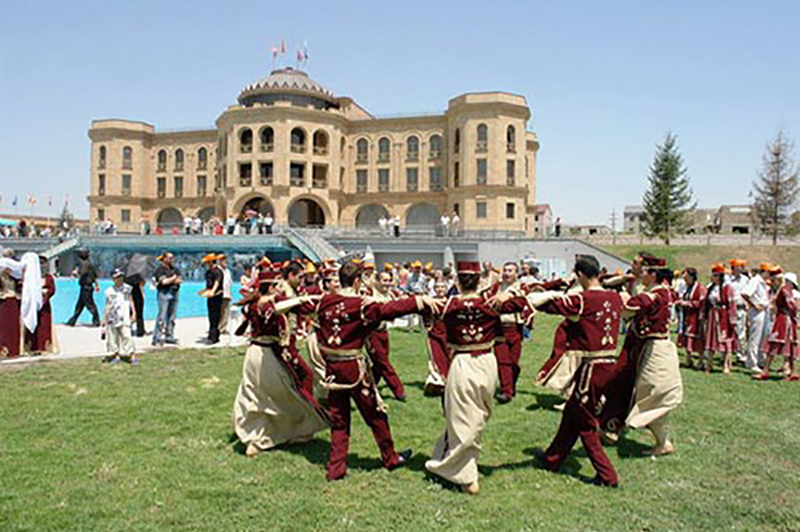 The festival is held in Yerevan. The festival usually appear several theater groups from different countries. (In a short time we will send you more details). 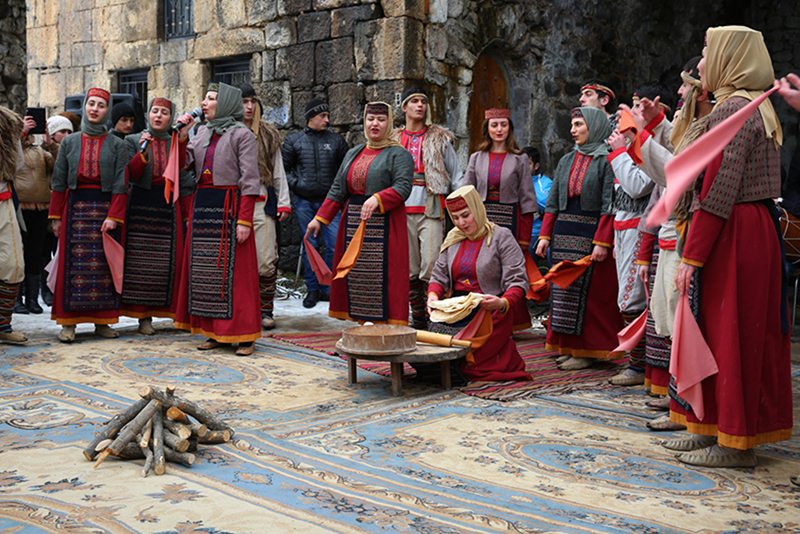 The festival is held in the villages Areni, Rind Vayotsdzor area. 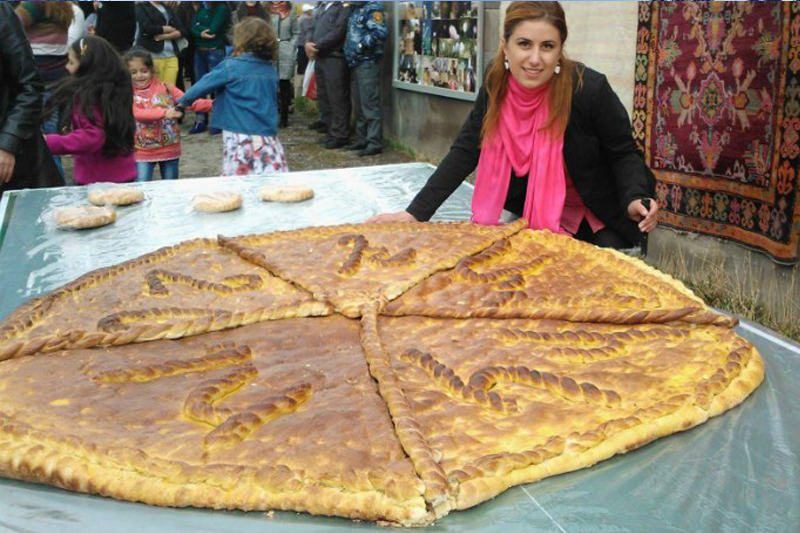 Festival of Armenian gata will be held, which is held for the third time where you become an eyewitness of the world,s largest gata baked in the village of Khachik. 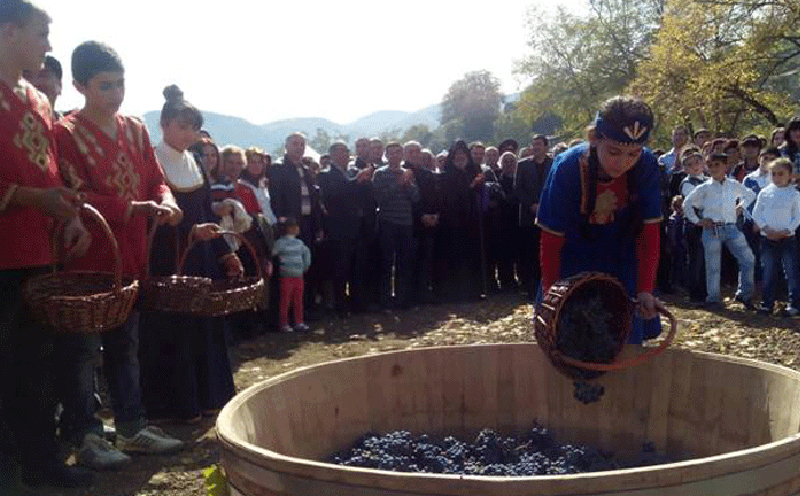 From now on Artsakh wine festival will be held every year on the third Saturday of October. Wine festival full of various events. During the festival will be organized display of the best wines of Artsakh ,Artsakh traditional manufacturing methods, as well as tasting the best wines of Artsakh. It is also planned an extensive cultural program, concerts, exhibitions and tasting traditional dishes of Artsakh. Airport - Tour in Yerevan. Arrival at the airport and transfer to the hotel in Yerevan, accommodation and a little rest. Tour to Matenadaran , research institute and museum, which holds one of the world's richest depositories of medieval manuscripts and books. Bus tour in Yerevan with stops near statue of David of Sassoun and Mother Armenia statue at Victory park with an incredible overview of a city. The Cascade complex, Cafesjian Center for the Arts, Opera house. 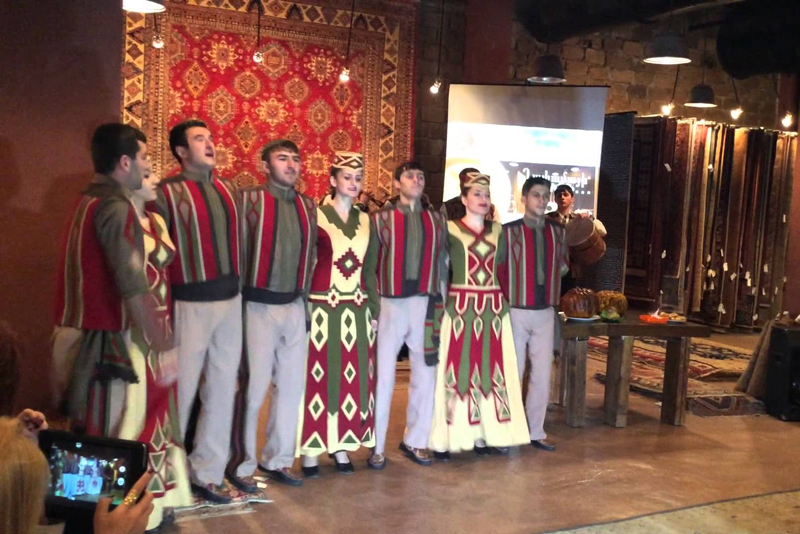 Welcome dinner at ,Yerevan Tavern, restaurant with folk program (Armenian national songs and dances). Evening walk from the Northern Avenue to Republic Square. Participation in Dancing fountains show. Return to the hotel. Breakfast at hotel. Tour to so called ,Armenian Vatican, Echmiadzin , the spiritual center of Armenia, where Pontifical Residence of Catholicos of All Armenians , the head of Armenian Apostolic church is located. The city is just about 20 km from Yerevan. 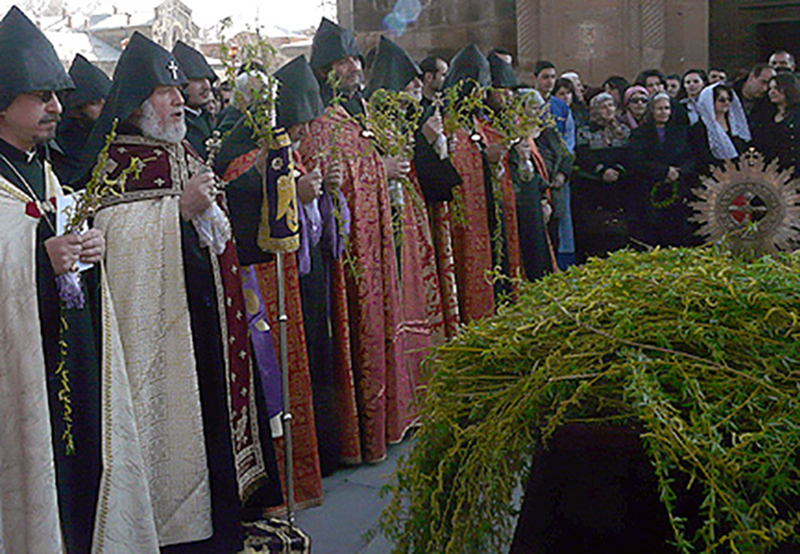 Here we'll visit 4th century Echmiadzin Cathedral, Echmiadzin treasury, where the lance that pierced the side of Christ by the Roman soldier is also exposed. We will visit Zvartnots Cathedral, which is considered as a masterpiece of early medieval Armenian architecture, and listed as UNESCO World Heritage Site. 14:00 Lunch at apricot orchard of ,Van, restaurant in the open air. Return to Yerevan, where we,ll visit Ararat brandy factory and taste few brands of Armenian brandy (cognac). Free evening in Yerevan. Breakfast at hotel. 8:00 Check out of a hotel and heading for the South of Armenia. First stop , Khor Virap Monastery which offers magnificent view on biblical Mount Ararat. Visiting Trchuneri (Bird) cave, where we also can find 6000 years old winery. Few years ago the oldest shoe in history had been found also in this region. Despite the fact, that the archeological excavations are still ongoing, we have a chance to peak into a mystical cave. It is Areni wine region, where famous red wine Areni is produced. We will not miss a chance to taste it at one of local wineries or at home of local peasant. Visiting of Noravank Monastery of XIII century, hidden in mystic red cliffs. Lunch at ,Lchak, restataurant. We will rise from Alidzor village to Tatev monastery on a cableway ,Wings of Tatev,. Accomodation at Mirhav hotel in Goris. 20:00 Dinner at the hotel. Breakfast at the hotel Leaving for the tour 9:00 Karahunj , Zorats Qarer, is a prehistoric archaeological site of VI millennium BC, which is often called as the ,Armenian Stonehenge,. Vardenyats (Selim) caravanserai , one of the important destinations in Armenia on Great Silk Road. This buildings were built along commercial routes for the accommodation of travelers, who were travelled from Europe to the East. Noratus , the biggest khachkar cemetery on the territory of modern Armenia. Lunch at seaside Tsovatsoc restaurant, a dish from local sig fish, brand kebabs from Sevan crayfish. 15:00 Tour to Sevan lake , the biggest lake in Caucasus. On the North-West shore we will visit Sevanavank monastery. 17:00 Rest and dinner at colorful guest house Tsaghkunq, the chief will give a masterclass in cooking a lamb in tandoor (for 10+ groups). 21:00 Transfer to Tsaghkadzor, accommodation at the hotel. Breakfast at the hotel. 10:00 Check out of the hotel. 10:15 We will rise one level on Tsaghkadzor cableroad. 11:00 Kecharis monastery. Photo-stop near Charents arch against the backdrop of Mount Ararat. Tour to Geghard medieval monastery , a fantastic example of medieval Armenian architecture of XII century. It is listed as UNESCO World Heritage Site. Lunch at village house in Garni, participation in baking Armenian bread lavash. Live performance of Armenian national instrument duduk. Tour to pagan temple Garni , the only preserved monument, referring to the era of paganism and Hellenism. 16:30 A short walking tour to Garni gorge , to the natural wonder "Symphony of the Stones". Return to Yerevan and accommodation at the hotel, time for rest. Free evening. Breakfast at the hotel. Preparing for the tour. History museum of Armenia, where different eras of the Armenian Highland are represented - beginning from the Paleolithic to the present days. Time for shopping. You can chose from a big variety of souvenirs and local products, which are in high demand among our guests , wines, brandies, dried fruits, sweets, herbs, jewelry, etc. 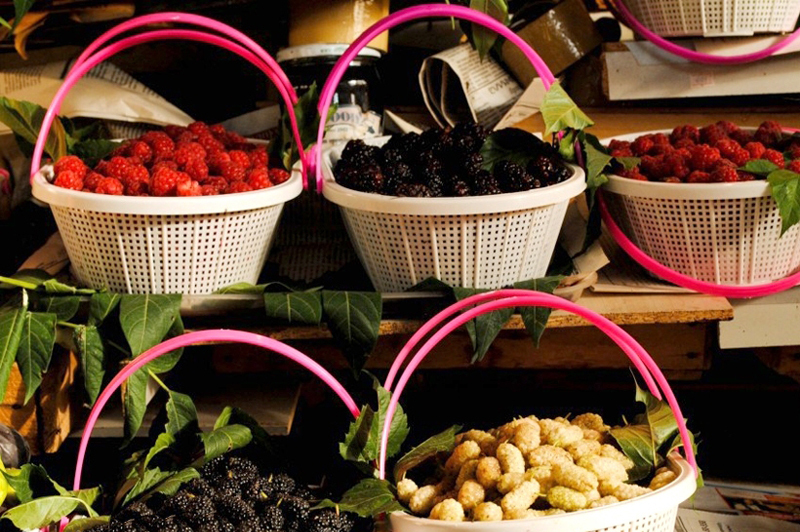 For this purpose we will visit the souvenir market Vernissage and Tashir , the market of local sweets and dried fruits. Lunch at refined restaurant Charentsi 28 of Western Armenian cuisine. Afterwards we will go on tour to Amberd Fortress , the historical security complex, which consists of the castle of VII century and the church of XI century. It's one of the fewest preserved fortresses on the territory of Armenia. Free evening. Breakfast at the hotel. Check out of the hotel. Transfer to airport.